Medupi Power Station during its construction stages. It produced its first electricity on Monday. 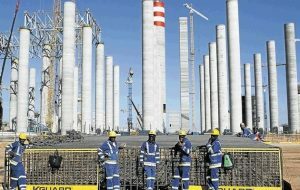 South Africa made history on Monday when they put on line their first new power station in twenty years which happens amid a myriad of economic problems that have been largely attributed to the incidence of power problems in Africa’s second largest economy. 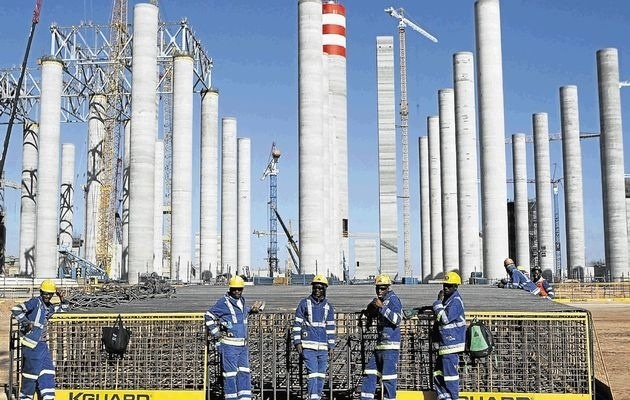 The state owned power utility, Eskom said the Medupi Power Station will, at the beginning, inject 794 megawatts of power into the South African power grid, a power grid that has been under immense strain for some time resulting in a number of power cuts that have not been friendly to the economy. Speaking on the occasion to mark the occasion,the Eskom Chief Executive Officer, Tshediso Matona, said having the coal fired Medupi Power Station join the national grid marked an exciting milestone towards full commercial power. He added that the power station, whose construction has been delayed for a number of years, is expected to have a total of 4 764 megawatts once it is working at full capacity. This, he said was expected to happen in 2017 when all the six units have been completed. Also speaking at the same occasion, the Public Enteprises minister, Lynne Browne said the firing of the Medupi Power station and having it join the national grid was going to contribute greatly towards the South African economy as well as that of the region in the long run. The South African industries, businesses as well as individual homes have, in the last few years borne the brunt of mediocre service from the power utility as many power cuts in what has been a catch phrase of load shedding had become the order of the day. This has significantly led to the slowing down of the South African economy from an initial real growth of 3.4% in the last quarter of 2013 to a meager 1.5% at the end of last year. This has largely been attributed to the power cuts which had become the order of the day. This state of affairs has led government, through Eskom which takes care of close to 95% of the country’s power requirements, to mute plans to build eight nuclear reactors which are hoped to add a total of 9 600 megawatts of power to the national grid. While this has been welcome in many quarters, it has been the prohibitive cost of $50 billion (45 billion euros) that has sparked intense debates on whether this was a worthwhile venture.